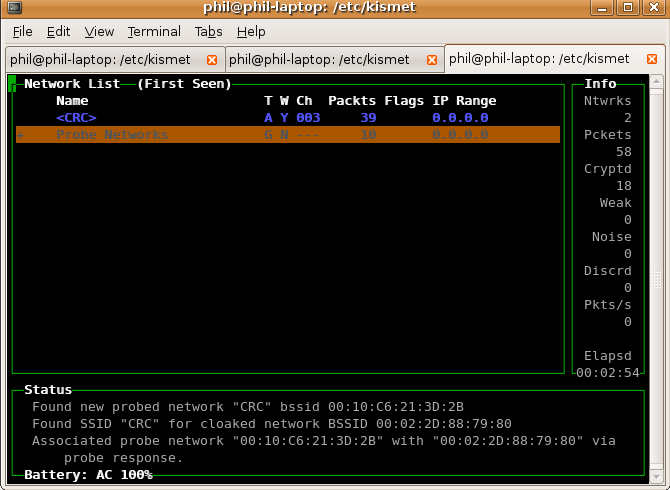 Here’s how I got Kismet running on Ubuntu on my Asus W3V laptop. If you don’t know your relevant network driver, view the Kismet Readme and scroll down to the section “12. Capture Sources”. My driver is ipw2200. Works like a charm on a beta install of Hardy Heron on my Acer Travelmate 4102WLMi. yeah thanks, this guide was helpful for a toshiba satellite laptop. restart or reconfigure it for normal operation. I know this thread is a little old but I was wondering why the ‘normal’ installation doesn’t work. ex. I got the file from kismets website decompressed the gz file and did a cd into the directory. I ran ./configure which gave me an error message about not having libpcap, which gave me an error saying it didn’t have flex, which then gave me an error saying I didn’t have m4? Also a good note I decompressed all these files in a directory I called ‘programs’ I’m new to linux so a lot of this is new to me. If anyone could point me into the right direction why the installation I used failed I would greatly appreciate it. I did get the program running through the method described on the site, kudos sir!!! Works for me on Ubuntu Intrepid. 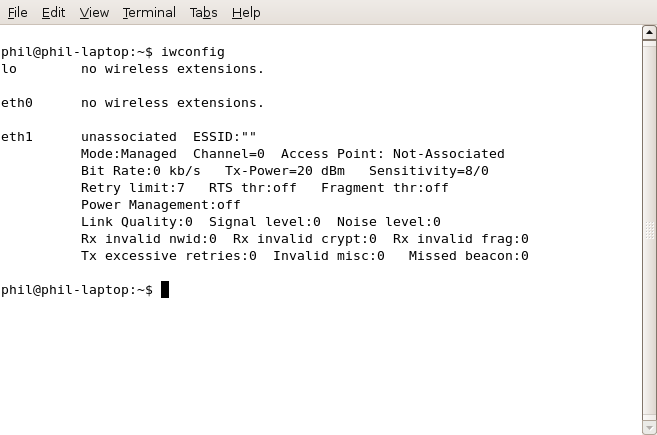 I have “atheros AR5001 wireless network adapter” on my laptop and I can’t find out the kernel. I try some of them (from kismet readme) but it doesn’t seems to work. Suid priv-dropping disabled. This may not be secure. No specific sources given to be enabled, all will be enabled. And this is my terminal with source type ipw2100. NOTICE: Disabling channel hopping, no enabled sources are able to change channel. I am having a Dell Laptop in which Ubuntu uses a properietary driver not an open source driver. as to what should I change this to. I have read the section of Capture Source on Kismet website but I am still not clear with it.